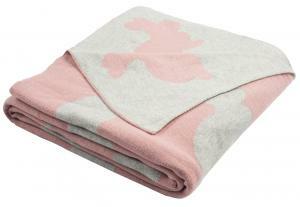 The whimsical look of animal motifs is beautifully displayed in the Bunny Hop Knit Throw. Delightful tones of blossom pink and vanilla grey accentuate the charm of the reversible bunny silhouette pattern. Finely stitched cotton yarns make this a soft, light covering ideal for your bench, accent chair, love seat or sofa.